Wunderlich: Eternal vigilance in the face of endlessly recurring evil—it’s the concept that makes everything in this book mean that much more. At its core, Eternal Warrior is a simple book with a simple hook. Gilad has been fighting forever (or at least thousands of years) and though he’ll always despise the necessity of war, violence, and murder, it’s what he’s best at. He wants to see peace, the end of evil and a better world, but knows this is a dream far from reality. It always has been and he fears it always will be, but he fights for it nonetheless. Understand this and you can pick up any issue of Eternal Warrior, past, present or (I imagine) future and you will find something to enjoy. I like your fancy, heavy opening quote up there Elkin. Many moments in this book can be enriched with those words in mind. If everyone in Gilad’s world was as eternal as he, would his utopia be achieved? If the evil he faces had seen the things he’d seen, had been through what he’d been through and experienced the evils of the past, would the world finally progress past these endless cycles of killing? I like to think Pak is reasoning along the same lines as us when he has Gilad finally encounter the enemy he was so intent on murdering. Without giving anything away, the final pages prove that progress depends on retentiveness. After all, Gilad’s skills as a warrior go far beyond his brawn. The handling of said enemy is wonderful as well. You mention “the inevitability of all technology in the hands of man being crafted to kill, and how innocence is subsumed by man's inherent capacity for cruelty” and I think that’s right on the money. Pak purposely writes these villains as generally cordial people, forced by situation and then given the tools to do evil things. Elkin: That's true, Wunderlich, until, of course, he introduces The Death Cult. Nothing is ever cordial about a Death Cult. We've talked about how Pak has been able to balance the deep-rooted nihilism of his theme with a glimmer of hope for change. Will the circle of savagery be broken? There is always hope for the future, even in the year 4001. Without this little light, Eternal Warrior #7 would overwhelm its readers, thrusting them into a too dark place. And I think the art team helps enormously with this. Artist Robert Gill can render the human smile so that it conveys as much welcoming warmth as it does a sense of innocence bred in a clear lack of not comprehending the ramifications of one's actions. There is a guilelessness in everyone's eyes that is counterbalanced by the weariness washed across Gilad's face. Colorist Guy Major then washes everything in soft tones, adding a soothing sensibility that swaddles the reader, providing a comfortable space, a sense a safety and warmth that, I have a feeling, will be ripped away as the story arc heads to its conclusion. And then finally, there's Dave Sharpe, using the tools of the Letterer to convey tone, heft, and accentuation. Through his art, Sharpe can even make the noises the emanate from the Carpentier Bennington Guard Bots seems almost cute. And that's a talent. 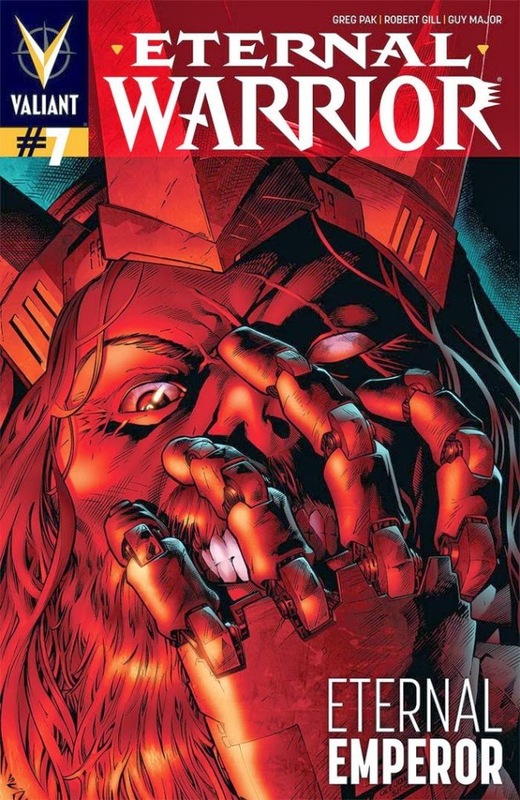 Eternal Warrior has been one of my favorite series launched by the new Valiant because its team has done such an amazing job of holding tension. Quiet moments are soaked in the hues of the inevitable shatter, while bursts of action are kinetic and purposeful. The series refuses to be hoisted by its own petard because of this – as the story grows even more epic in scale we are reminded of the humanness at its core. Wunderlich: Back to the art for a second, I must say I enjoyed the team’s efforts. Robert Gill is a new name to me and he impresses right out of the gate. His work is detailed, neat, and clear without being static. I’m with you on the eyes too, there are layers behind the characters’ looks and Gill gives us plenty to read into. My big complaint here is the blurring effects used. It’s a huge pet peeve of mine and really distracts from the story. Gill’s art is dynamic enough without the motion blur. I’m not sure who’s to blame, but whoever is adding in these digital effects, stop it! Pak’s Eternal Warrior, so far, is my second favorite rendition of the character. Give him a few more issues and Pak could knock Ostrander’s mid-90s run out of my number one spot. That would be quite the feat, but if they maintain the quality of art and keep the stories as deep and accessible as they are now, I’m confident this title will succeed. And did I mention this is only the second issue I’ve read from Valiant’s re-launch? That’s right, I feel completely caught up and at ease with the story thanks to the (always amazing) re-cap page. If you feel like issue 7 might be a scary place to start, trust me, it’s as good as any. Valiant’s books are the new reader friendly books right now. Of course, the quality here has convinced me I now need to buy all the issues I’ve missed. It’s also got me in the mood to go back and read the original Eternal Warrior series. When a book convinces me to spend that much time and money on something, you can bet it’s something special. Elkin: “When a book convinces Wunderlich to spend that much time and money on something, you can bet it’s something special.” There's your pull quote, Valiant.